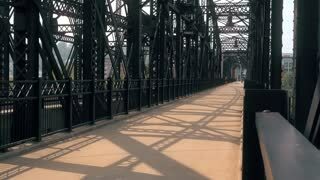 A slowly moving forward aerial view of the Hot Metal Bridge over the Monongahela River on Pittsburgh's South Side. PITTSBURGH, PA - Circa September, 2015 - Bicyclists ride their bikes over the Hot Metal Street Bridge on Pittsburgh's South Side. A low angle forward moving aerial establishing shot of a boating marina on the Monongahela River with the Pittsburgh skyline in the distance. 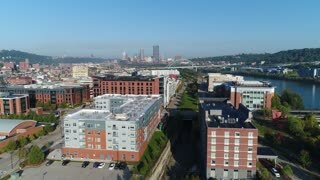 A high angle aerial daytime forward moving establishing shot of Pittsburgh's South Side businesses and neighborhoods with the Hot Metal Bridge in the distance. PITTSBURGH, PA - Circa September, 2017 - An early morning establishing shot of a jogger on the Hot Metal Street Bridge in Pittsburgh's South Side district. 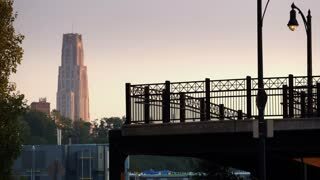 Pitt's Cathedral of Learning is in the distance. An early morning establishing shot of traffic passing on the Hot Metal Bridge over the Monongahela River on Pittsburgh's South Side. A slowly rising aerial view of the Hot Metal Bridge over the Monongahela River on Pittsburgh's South Side. A dramatic rising aerial view of the Hot Metal Bridge over the Monongahela River on Pittsburgh's South Side.